Is Retin-A safe for Black Skin? 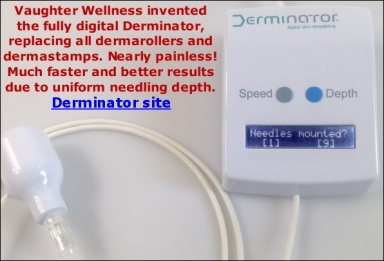 I've recently ordered and received a dermaroller from your shop to reduce the appearance of my stretch marks. I saw in your instructions for stretch marks that it is beneficial to use Retin-A. My questions are: is it safe for Black skin (darker tones)? And if so, what concentration do you recommend? Re: Is Retin-A safe for Black Skin? Our customers haven't reported any problems with Tretinoin cream used on stretch marks on darker skin tones but just to be sure about each individual case, try it several times on one stretch mark only to see how your skin reacts - color-wise. When in doubt, apply it mainly to the stretch marks, trying to avoid the surrounding skin. You can apply it for example with a small piece of cotton pad wrapped around a tooth pick. Hi Sarah, I have had quite significant results using the 1.5 mm dermaroller and stamp (2months to be exact since I first dermarolled) and next week will be my 3rd session. Reading mila's success thread, I have altered a few things to my routine which includes switching to a 2mm stamp, from a 1.5mm and using a retin-a 0.025%. -Can individuals with problem skin (acne, scarring, large pores etc) use the retin-a indefinitely? All year round? Or would retin-a need to be cycled: 2months on, 1 month off (similar to what you advised about hydroquinone)? -Once I've applied retin-a, is it fine to use an oil (olive oil, coconut, almond oil) over my skin as a moisturiser? Or shall I wait until the morning to moisturise my face? I am delighted to hear your skin improved after microneedling! Retin A does not need to be cycled but it makes the skin more sensitive to UV so you either have to use a sunscreen or reduce or discontinue the application of Retin A in summer. In principle you can, but I do not really recommend using Tretinoin on the sensitive skin around the eyes. Our Infadolan ointment that contains Retinyl acetate is more suitable in this area. Apply daily, just a little. Initially, Tretinoin makes the skin dry. Wrinkles and lines are more visible on dry skin and that is why it may seem in some cases that Tretinoin worsened wrinkles - but it did not. This is most likely to be the impression around the eyes where the skin is naturally less oily than elsewhere due to very few glands in the area. >moisturiser? Or shall I wait until the morning to moisturise my face? Vit. A is oil-soluble and you can use any kind of moisturizer on top of Retin A. Tretinoin (Retin A) dries out the skin (especially initially) and it is a very good idea to use a moisturizer and even heavy moisturizers such as oils to offset the drying effect.